It’s no secret that kids love to be in the kitchen – usually while you’re trying to make dinner, prep for dinner, or clean up from dinner. While your kids are showing an interest in the kitchen, why not arm them with their own kitchen tools and make them your sous chefs? Kids love having independence and being able to master a task – especially tasks that seem more “grown-up” like cooking. Here are some items that will help! Every aspiring chef needs their own set of knives! These knives are super safe for tiny fingers – they will easily cut through fruits and veggies, but won’t cut skin. This is a great tool to help your child work on fine motor skills, as well as include them in food preparation! You can find your child’s knife set here. This item is a little pricier due to the shipping costs from the UK, but it’s entirely worth it in my opinion. Treat your tiny chef to this beautifully handcrafted set of personalized cooking tools along with a personalized cotton drawstring bag. The set includes a rolling pin, spatula, pastry brush, spoon, and cutting board – all of which are personalized with your child’s name (besides the pastry brush). Pick up your personalized set here. This is a great 6-piece set made by Curious Chef, which makes actual kitchen tools for kids (as opposed to toy tools). This set includes a vegetable scrubber, melon baller, a medium-sized nylon knife, apple slicer, large silicone spoon, and a vegetable peeler. As a bonus, it also comes with a sticker set and a shopping menu with a free recipe! This set would really help kids build independence in the kitchen by allowing them to start preparing their own healthy snacks. This beautiful learning tower is handmade to order and comes in a variety of stains and finishes to ensure that it will look great in your kitchen. A learning tower is a fantastic way to allow your children to safely stand in the kitchen and help you at the counter! This learning tower is here. This durable, plastic measuring cup is dishwasher safe and has three different pouring spouts to make measuring easy for your kids in the kitchen. It features a sturdy handle with a great grip, so you don’t have to stress as you watch your child walk across the kitchen with it! You can pick up this great measuring cup here. Yes, that’s right, *another* great Curious Chef product! These measuring spoons are made from durable BPA-free plastic with vibrant colors, no-drip edges, and soft bubble grips that your kids will love. This cookbook is a great way to get kids extra interested in cooking – and all the recipes are aimed at ages 6 through 12. The book starts by discussing techniques and tools for the kitchen, and then moves on to fun recipes such as french toast, pizza, and more! Pick up this cookbook here! This farmhouse-style apron will look great in your kitchen – and your child will love wearing their own apron! Choose from black, white, or charcoal grey text on a natural apron by going here. Help kids develop independence in the kitchen with these tools – and give yourself a break! Hey, maybe they can even cook *you* a meal for once! Please “Pin IT” if you found this helpful! 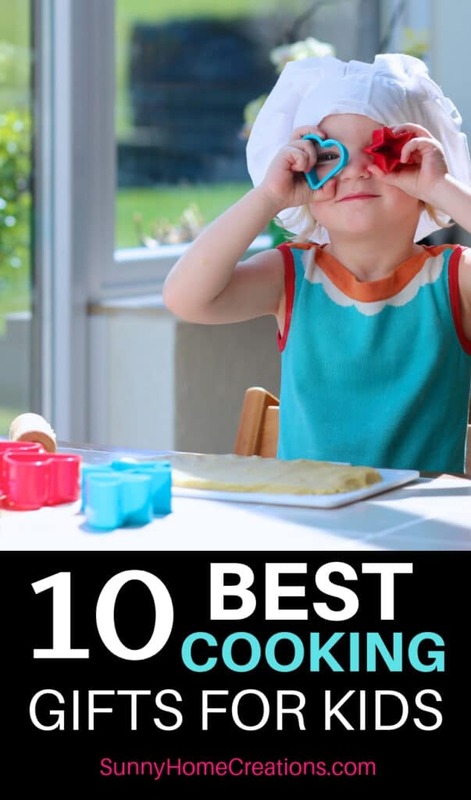 Simple & Easy Ways to Make Cooking with Kids FUN!